Kathryn Falk, founder of Romantic Times, now known as RT Book Reviews, announced today at the 2018 RT Booklovers Convention in Reno, Nevada that she is retiring and bringing RT to an end. I've never been to a RT convention but I've subscribed to the magazine for 18+ years and have discovered many favorite authors and books within its pages. It's the end of an era...but, possibly, the beginning of a new one. After 38 years, I am retiring and ending my participation in publishing. It was a great privilege to have a lifetime experience in the book industry and specifically women’s fiction. When I wrote Love’s Leading Ladies and published the first issue of Romantic Times in 1981, I tapped into a new emerging market. As a longtime reader, especially of historical novels, I was curious about the new Romance genre that was selling millions of books to readers who craved more sexually explicit books. I began reading contemporary books as well as historical to research my book of 65 profiles, Love’s Leading Ladies. It included Bertrice Small, Barbara Cartland, Janet Dailey, Rosemary Rogers, Kathleen Woodiwiss, Virginia Henley, Janelle Taylor, Danielle Steel, and other bestselling female authors. I became more curious about the industry and decided a newsletter was needed to alert readers to all the books being published. Readers like me want to know when new titles from their favorite authors were coming out, reviews of the top reads, profiles of authors and cover illustrators, and how to write a romance and get it published. The first issue of RT, as it became known, arrived at the bookstores in June of 1981 and was an immediate success, even though it was in tabloid format on newsprint. White glossy paper was too expensive for my budget in those early days, and one had to paste down galleys for copy since computers and desktop publishing had not arrived on the scene. One of my neighbors was skilled in layouts and we produced an issue every two months. 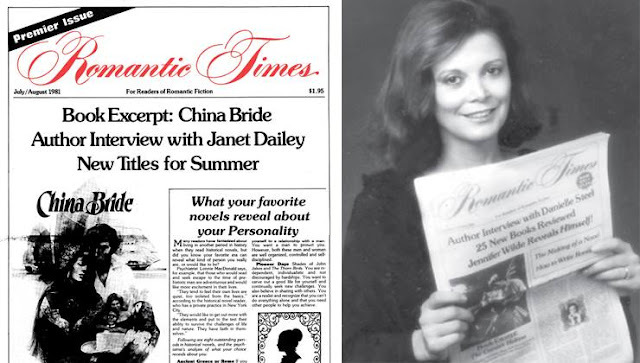 By 1983, I had written How to Write a Romance and Get it Published, which went from hardcover to paperback (3 editions) for the next decade and inspired new writers to enter the Romance market. The next expansion came with our annual RT Booklovers Convention, attracting thousands of readers, writers, booksellers, librarians, literary agents, and publishers over the years. Recently, we celebrated the 35th convention in Reno, Nevada. I want to thank the staffs of RT Magazine and RT Booklovers Convention, the editors and reviewers, and all who participated over the years. My appreciation to the publishers includes Avon, Harlequin, St. Martin’s and Kensington, who are still producing romance novels. I offer my everlasting gratitude to all those who have been with me for much of the journey: Carol Stacy, Kathe Robin, Nancy Collazo, Kate Ryan, and Jo Carol, and, of course, my husband, Ken. They have contributed so much. A special salute goes to my friends in the publishing industry for giving me the opportunity to create so many innovations for the Romance genre and to meet many lovely people and handsome men! And to our many thousands of Dear Readers, thank you for your support and participation with us all these years! Whether you joined with us at the beginning or along the way. NOTE: https://www.rtbookreviews.com will remain live for about a year with its 70,000 blogs, reviews and 37 years of awards available through the search function. After a year the site will go dark. Following Falk's announcement, it was also announced that at least one of the people behind the RT conventions is involved with a new reader-author convention called BookLoversCon that is scheduled to launch May 15-19, 2019 in New Orleans. Wow! Happy for her retirement. Sometimes that is the hardest part. Saying goodbye to an old friend. I'm sure it was not an easy decision to make, especially after 38 years at the helm. It is a hard decision to make. I hope retirement is enjoyable. I was lucky enough to attend the RT Convention in Dallas, Texas a few years ago. It was a wonderful, enjoyable experience. I was not expecting such a large event with so much going on. I was hoping to attend another one. I will have to see what BookLoversCon has to offer next year. New Orleans is a favorite place for us to visit. I'm sure it wasn't a decision she took lightly, but she sure was a pioneer for the industry. Its so sad. I looked forward to the magazine every month. It introduced me to lots of authors I knew nothing about and books I have loved. Happy retirement!!!! It's always sad to have to say goodbye to something that so many people have loved and enjoyed for years. I'm sure it's been harder on her than it's been for us readers. I'm sad because it's the end but I'm glad she's doing what she thinks it's best for her. Good luck to her!